“For 2018 we can expect to see an increase of color in kitchen designs, from the cabinetry to the sink materials,” said Houston designer Nina Magon, who foresees basins in granite and concrete as well as copper. U.S. companies are offering exuberantly toned enamel stoves, which have long warmed French and English kitchens. 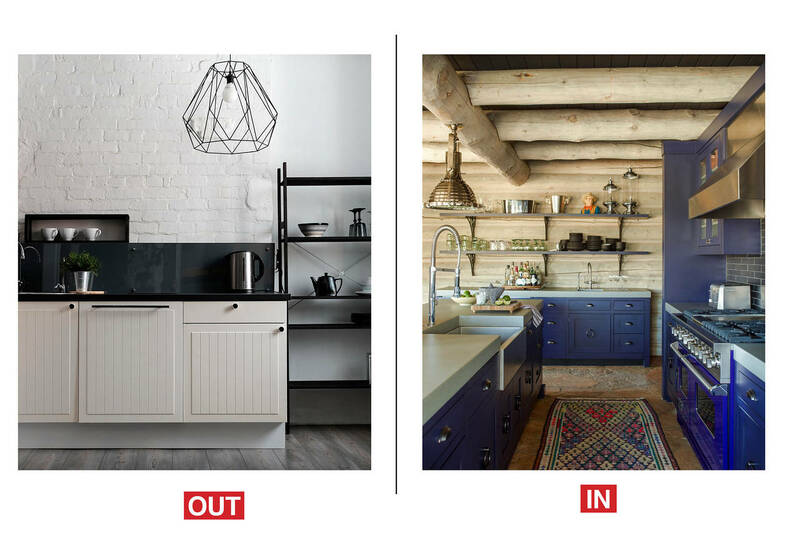 Viking, the maker of the stove in the above Colorado kitchen by designer Thom Filicia, offers ranges in apple red, cobalt blue and Bordeaux. BlueStar offers appliances in 750 color options. “Kitchens are treated more like living and dining rooms,” said New York designer Vanessa Deleon. Their design is following the general wave of layered eclecticism. Meanwhile, abstractions of nature are heating up. “Nature will always fascinate,” Mr. Dunn observed, “and bio-mimicry is an intuitive next step in bringing the outdoors inside in an abstract and visceral way.” Rebecca Atwood’s Blooms Wallpaper, above, exemplifies the trend, evoking nature with randomly scattered biomorphic shapes. “An all-over organic approach to pattern feels more honest than rigid patterns that you can see stop and start,” said Ms. Dopp, who took a cue from stone veining for one of her recent textile designs. “This year will bring more soft pastels, gentle colors that appear in nature, and oak-hued wood finishes,” predicted New York Designer Ámbar Margarida. Fellow New York designer Ghislaine Viñas pointed out that these pastels aren’t pure but rather have been muddied with earthier tones in the mixing process—see Benjamin Moore’s Silver Marlin and Farrow and Ball’s Cinder Rose andCooking Apple Green, shown above.. “We’ll see mint greens mixed in with jades and sages and other combinations working off some very grounded mustard tones,” she added. “Curvy is a natural expression of maximalism: luscious spaces, unabashed layering and sensuous shapes,” said Anna Brockway, co-founder of design site Chairish, which predicted rounded furnishings for 2018. Soft lines, like those in the above swerve-legged desk by Marmol Radziner for McGuire, out this spring, “feel more fluid and casual,” said Ms. Ramchandani, who finds herself inspired lately by Vladimir Kagan’s curvaceous sofas. “U-shaped chairs, for example, hug you, creating a cozier, more inviting space,” added Houston designer Nina Magon. Spit-shined drawer pulls, faucets, and even sinks are starting to look like glaring mistakes. “Slick metals seem as though they belong in a diner with bad vinyl furniture,” said Nashville designer Jonathan Savage of treated metals such as chrome and titanium, which remain impersonal and pristine no matter how often they are touched. “Rose gold faucets and shiny copper can also read as cheap and trendy,” warned Boston’s Ms. Gates. “Anything that looks bright and new and like it was mass produced in China yesterday is something we run away from,” said interior designer Chad James, also of Nashville. “For a more relaxed, residential environment, we lean toward living metals that show someone actually lives in the home,” said Mr. Savage of finishes that develop character over time, like the above unlacquered-brass shower controls by Waterworks. Pale composite white bronze, which also patinates, is seeing more use. “It’s richer and more substantial than nickel,” said New York designer Alan Tanksley. The au courant will say goodbye to stainless steel kitchen sinks and choose living metals such as copper, said San Francisco designer Grant Gibson. “There’s something nostalgic about metals that have warmth and evolve with the oils of someone’s hands,” added Mr. James.